No matter where you are on this Earth, you will encounter days, weeks, or months of cold weather–the kind of weather that you want to just curl up on the couch with a comfy sweater and a cup of tea (or coffee, if that’s your preference). This Hexagonal Granny Cardigan is that perfect sweater for the cold weather days. It’s like wrapping yourself up in the comfort of your favorite blanket! Follow along with this video to make yours today! In this video I make a size small/medium, but I give clear instructions on how to make it bigger or smaller using your measurements. There are a lot of fun details that go into this cardigan, from pockets, to the hood, to the trim, to the length. A lot of this pattern is creator’s choice. You can make variations for all these details. If you opt not to add a hood, you can follow along on the hood part, but just do 5-10 rows without sewing it closed. It will give a collar look. You can put buttons down the whole front. Add toggles as buttons. You can add the pockets, or leave the pockets out. Your color choices are unlimited. I used one wooden button at the neck that I got on Etsy through the shop WoodBeFancy. You should check it out and get your buttons there!! One of my biggest guidance suggestions is to use a lighter weight yarn. This is a VERY heavy piece, even with the Caron Simply Soft yarn. The bulkier the yarn, the bulkier the sweater. 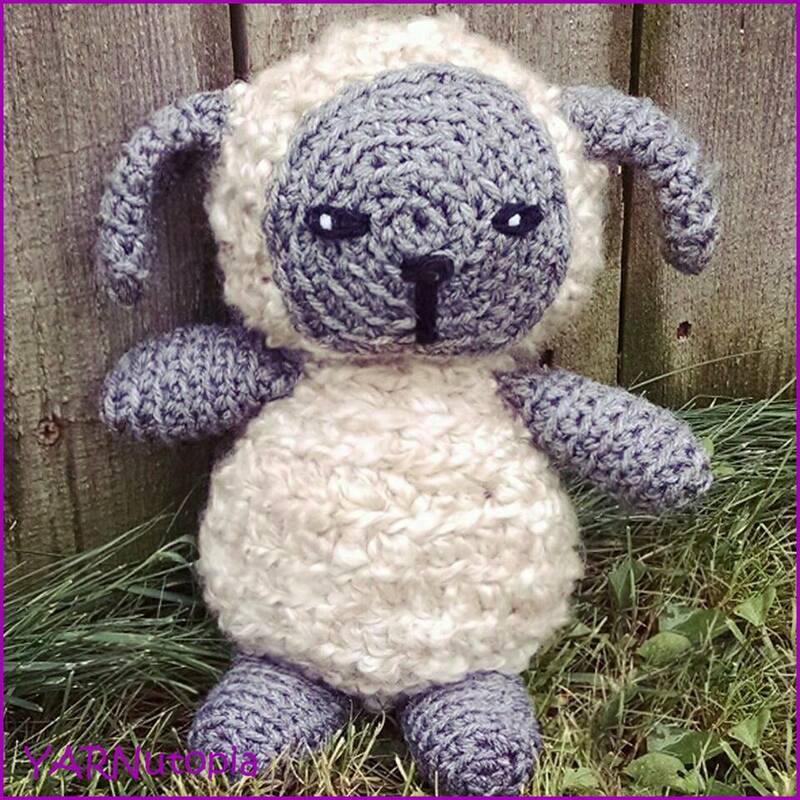 Click here to read about my first prototype where I used the same pattern using Red Heart yarn which is a lot heavier and bulkier. Overall, using the Red Heart yarn, it looked nice, but I felt like it was WAY too bulky for my body shape, and it is EXTREMELY heavy. That is an absolute personal preference. I cannot wait to see how creative all of you will be!! Go wild with your patterns!! I LOVE IT! Share your cardigan on ‘our Facebook! 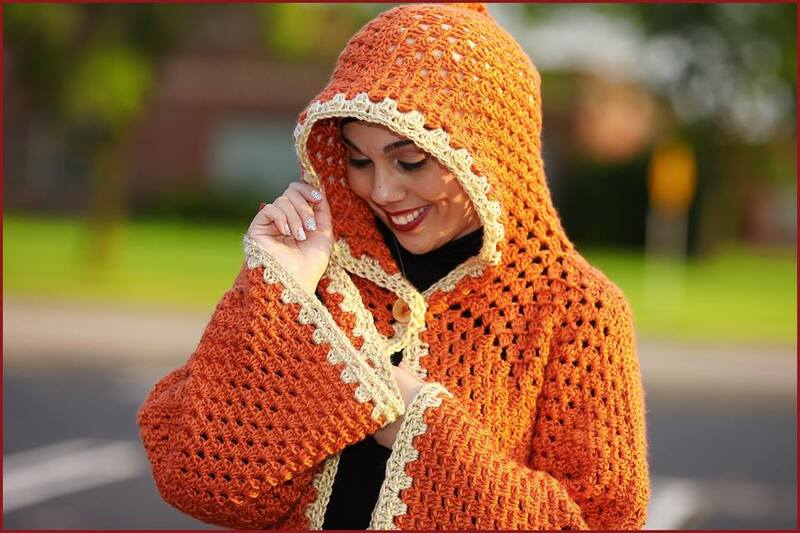 This pattern is worked by making 2 hexagons first, then sewing the sleeves, then lengthening the cardigan, then sewing the back, then lengthening the sleeves, then making the hood, then doing the finishing touches with the pockets and trim. If my written pattern gets confusing, refer to the video for easy to follow visual instructions. Rnd 3: 2 dc in same corner sp. *3 dc in sp between double crochet groupings from prev. row until you get to the next corner. (3dc, ch 2, 3dc) in next corner. Repeat from * around. End each round with ch 1, sc to ch up 3 at the beginning of round. Ch 3, turn. Repeat round 3 until one side of the hexagon measures half of your chest measurement. (If your chest measures 40 inches, make sure that each side of the hexagon measures 20 inches) If you make a few extra rounds, no biggie, it will be a little more slouchy of a cardigan. On your very last round, be sure to end it with a ch 2, sl st to ch up 3 at beginning of round, fasten off with a long tail for sewing on both hexagons. Fold each hexagon to an “L” shape by matching up the corners. Be sure the corner you fastened off with is at the top of the sleeve. Sew the sleeves closed with that extra yarn you cut when you fastened off. (See video for instructions) Do not sew all the way closed, be sure to leave 4-5 dc groupings left unworked. Fasten off. Do this for both sleeves. Row 1: ch up 3, 2 more dc in corner sp, 3 dc in each sp between double crochet groupings until you get to the end, 3 dc into the corner, ch up 3, turn. Repeat rows 1 & 2 until you have reached desired length. (I made 20 rows) Repeat this process for the other hexagon as well. To fasten off, make sure to fasten off with a long tail for one hexagon. For the other hexagon, fasten off and weave in end. Round 2: Ch 3. In sp formed by sc at end of prev rnd work 2 dc, ch 2, 3 dc. *3 dc, ch 2, 3 dc* in each ch-2 sp. Join with ch 1, sc to first ch up 3 of rnd. Round 3: Ch 3. Work 2 dc in same sp. Work 3 dc in each sp bet 3-dc groups and work 3 dc, ch 2, 3 dc in each ch-2 corner sp. Join with ch 1, sc to first ch up 3 of rnd. Repeat process for each sleeve. Fasten off, weave in all ends. With the change in seasons, it always gets me excited to try new winter projects. Although today is August 25th, 2015, the temperatures in the past few days were autumn-like here in Wisconsin, USA. The kind of weather where you feel the need to grab a jacket on your way out the door or wrap up on the couch in a warm afghan. I found this pattern by Lion Brand Yarns. It’s for a tam/beret. It appeared to be something I would enjoy making in a quick sitting, and it didn’t disappoint! In less than 2 hours I was able to make this cute chunky yarn tam. After completing the beret, there are a few things I would have changed. One would be the size, I made it a hair too small. I would adjust the hook size and use a 10.00mm hook (which the pattern calls for) instead of the 9.00mm hook I used. I also would have widened the brim band that fits around my forehead maybe making 16 or 18 rounds instead of the 14 that the pattern calls for. That is just my own personal preference to this pattern. Overall, I am very pleased with how this turned out. It is your classic tam beret, and it is extremely fashionable for the upcoming cooler weather. To view the written pattern, visit Lion Brand’s website or click here. You need to register and have an account with them to view the pattern. Follow along with this video tutorial to make your own beret. Recently, I was contacted to make a Hexagonal Granny Cardigan sweater. Anyone who knows me, knows that I will gladly accept a challenge that is crochet related. I felt a little over my head once I began. Things were just not going my way. I’m sure many of you can relate when you start a project and it doesn’t look anything like what it’s supposed to. So, I frogged my work, started over, walked away, got in a fight with my yarn, and I almost gave up. Almost. That’s what challenges are. They’re not always easy. They’re not always perfect. It’s trying to figure out how to create something from this ball of yarn with limited knowledge. So, I kept at it. I kept trying to solve this puzzle. Little by little, it started to take shape. I finished this cardigan in a time frame much longer than anticipated. Ultimately, it isn’t exactly what I wanted to see in the end, but this is a prototype mock-up of a great project that I plan to film in the future. I will be making some changes now that I’m finished and can modify and fix some of the imperfections and problems that I encountered. I’ve had the opportunity to sit back and reassess my work and know how to recreate this jacket/duster/cardigan to improve it and make it a much better pattern. The original photo I was working off of had no written pattern, so I eyeballed the project with a lot of guesswork. I used Red Heart Yarn because it’s one of my go-to favorites. Unfortunately, for this particular project, it was just too bulky, so I will be changing the type of yarn to Caron Simply Soft for the final project. I also think that adding pockets on the front will vastly improve the overall look and usefulness of this great piece. Who doesn’t love a big comfy cardigan that you can wrap up in on a cold day, complete with pockets and a hood?! It’s like wrapping yourself up in a cozy blanket! All in all, I am satisfied with the way this one looks, so I’m excited to get started on the new modifications and sharing it with all of you! Stay tuned to this upcoming tutorial, and let me know what you think! Geared towards the beginner, this simple cotton face cloth is a great starter project for the crochet novice. A set of cotton washcloths make a lovely handmade gift that will be well received by anyone. Just recently, I made some homemade bars of soap and gave these as gifts to some of my friends. Pair it with a bar of homemade soap or a pump cleanser, and you have the perfect set that is sure to please. I love my cotton washcloths! I use them for all kinds of different things, washing dishes, face cleansing, wiping down dusty surfaces, dusting out the car, wiping up spills in the kitchen, the list goes on! Enjoy making this dishcloth! Row 2: sc in first st, *EDC in skipped ch from foundation row, sc in next st, repeat from * across. Ch 1, turn. Row 3: sc in first st, *ch 1, sk EDC from previous row, sc in next sc, repeat from * across. Ch 1, turn. Rows 4: sc in first st, *EDC in skipped st from previous row, sc in next st, repeat from * across, ch 1, turn. Continue to sc around the whole piece. Many times I stop to admire vintage baby clothing that I see in thrift shops and antique stores. I marvel over the craftsmanship of some of the old-fashioned designs, and I try to find ways to revive those patterns to keep the antiquity, yet add a little bit of modern feel. Today’s project is one such item. This baby bonnet is reminiscent of days gone by. This would make the perfect gift as part of a newborn layette. With a few modifications, you can make this for either gender. Feel free to add some embellishments such as a small flower on the design to make it more feminine, or a bow would be darling! You can interchange your ribbon with lace or a different color ribbon. You could add a little button for a more masculine look. Get creative with yours! This timeless look and classic design will sure to please anyone and will look precious on any baby, boy or girl. Follow this video to learn how to make this bonnet. Please do not copy and post this pattern and claim it as your own. Thank you, and happy hooking! This bonnet starts working in rounds, then is worked in rows. Bonnet Pattern: Work this entire part in the BLO! Rows 4-8: Repeat rows 2 & 3 ending on a repeat of row 2.
sc in first st, skip 2 sts, *5dc in next st, sk 2 sts, sc in next st, repeat from * across ending with sc in last st.
attach yarn to last st of row before scalloped edge. Ch 31, sl st in 2nd ch from hook and across whole ch. Fasten off once you get back to beginning where you attached. Weave in ends. Repeat for other side of bonnet. Weave ribbon around edge of bonnet through row right before scalloped edge letting it hang down the length of the tassels. I typically do not give in to major trends, but some just capture my heart. This owl has become popular in the crochet community and in decorating for baby nurseries and kids’ rooms. I could not resist making one of my own! I have made a few of these for gifts and they have been widely popular. They are perfect small stuffed toys that will give a child hours of contentment! There are no small parts so even babies can play with these as there are no choking hazards. For the feathers, I used the popular crocodile stitch which gives a very neat layered look. You can have fun with your owl by changing the colors, adding different expressive eyes, making it smaller or larger! Wouldn’t this be an awesome large pillow on a chair in a child’s room or in your own living room?! Owl enthusiasts will get a great kick out of this! Here is a photo of the final product. Below, you will find the video tutorial and written pattern. Here are some photos of owls that I have made in the past. As you can see, there are many fun ways to use this cute pillow! These are a hoot! HAHA! Click here to download the PDF File of this written pattern. View this video to get assistance in making this adorable little owl! taking care not to twist chain. Rnd 5-16: repeat rounds 3 & 4 or until piece measures 6 inches. Join gray yarn with sl st to any sc. Embroider eyelids/eyelashes with black yarn to eyes as seen in photo. Sew eyes to body on top gray portion.